Yesterday, I was going through a blog, I read that similar to our handwriting style, our typing pattern is also unique to ourselves. Some type faster and some slow between the keystrokes. And the choice of keyboard may also vary as some people prefer swipe-type keyboards and some are happy with traditional keyboard style. Thanks to Android, you can choose your best suited keyboard to customize the way you type. A huge number of keyboard apps are available in Play Store and today we present you, 6 best android keyboards, half of which are free and the rest are paid apps. Below presented apps are some of the best chosen keyboard apps with a lot of features stuffed into them and sometimes may differ from your preferences. So choose the best according to you. Let us see the free apps first, because free is always sweet to hear. GO Keyboard is one the most widely used free keyboard app for android. It is a product from the popular GO Launcher team. With its cool interface, GO Keyboard has drawn much attention and the ability to highly customize the app made it as the best chosen app. With almost 60 themes inbuilt, you will not get bored of the keyboard anymore. Prediction is not highly accurate and has support to many languages and keyboard layouts. It comes with “GO Keyboard Pad” mode which is more suitable for screens ranging from 5 to 10 inch. With emoji, skins and backgrounds typing is a fun go with GO Keyboard. Recently Google released its stock-android keyboard app on Play Store for free. For all those who love stock-android experience on their devices, they can opt out for this amazing keyboard app. With its highly enriched features, Google Keyboard can be the best competitor for the paid apps like Swype and Swift Key. With auto-complete, voice recognition, next-word suggestions and support to 26 different languages this new keyboard app stands out of the rest. This app can run only on Android 4.0 and above. 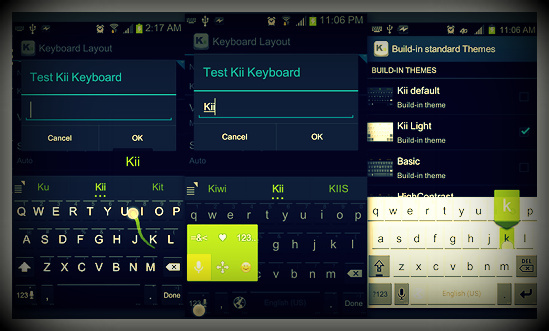 Kii Keyboard is one of the popular alternative keyboards for android. With much smoother and faster typing, this app has always been the fastest app on store. Kii Keyboard is optimized to both phones and also tablets. It has almost every feature from all the best android keyboard apps like HD themes support, gesture control, font & color customization, emoji input etc. Kii Keyboard supports 34 languages and has many keyboard layouts to choose. SwiftKey is an award-winning and best selling android keyboard app in 38 countries. Instead of tapping on the letters, swiping on the letters makes it faster to communicate and this is what is implemented with a blend of ferocious accuracy in this innovative app. It recognizes your typing style and makes corrections and predictions. You can seamlessly switch between tapping and gesture typing with its new SwiftKey Flow feature. It combines the mind-reading capabilities of SwiftKey with the speed of gliding your fingers across the screen. The best value for money you spend on the app is returned to you through its design, speed and accuracy. With 250+ million users all over the world, Swype has been the best keyboard app. Swype makes it fast and easy to input text on any screen. 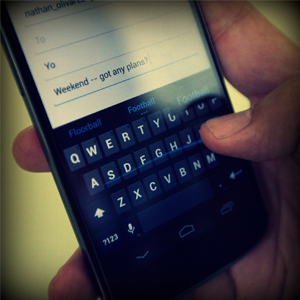 Swype pays attention to the way you input text and creates a personal language model that follows you. Using the four-in-one keyboard in Swype you can Swype, Type, Write or Speak to fit your input needs. There are 60 downloadable keyboard languages in Swype that let you communicate in any language. With Swype's gestures you can quickly accomplish common tasks like Capitalization, Punctuation Select All, Copy, Paste and even switch languages. Thumb Keyboard is one of the innovative and coolest apps in the store. With its flexible keyboard layouts, it makes typing very fast and easier using thumb. Keeping in the view of typing-needs for phablets and tablets with more screen size, Thumb Keyboard has stuffed-in many typing models to input text into the device easily. One-handed operation mode for large-screen phones is very useful. The versatility of being able to quickly swap between the different keyboards is highly appreciable. This app lacks swipe features, gesture and emoji. Whether you may swipe, tap or type, there are a number of keyboard apps in the store. Here are the most valued parameters to measure when choosing a keyboard app. · And of course price.